Joby, the wizard, went for a walk around the castle. The moat bubbled and popped with smelly gasses. He looked up at the tall towers, pointed and seeming to reach for the clouds. Now that Ichabod was the new head wizard of the castle, Joby kept to himself. He spent most of his time in the woods gathering acorns and moss. Joby had his own little room at the bottom of the castle. He kept his bottles of potions and magic herbs there, where nobody else could find. The egg was bright yellow with pink dots all over it. It was the biggest egg Joby had ever seen. He picked it up and carried it back to this tiny room. He put it down on the cold stone floor and went to find his magic wand. “Now where did I put my wand?” He looked on the shelf by his beakers and tubes of colorful liquid. “Ah, there it is.” It lay behind the book, Magic Potions and Spells. Joby carried the egg over to the fire. He lit the logs and soon the room warmed up. Joby sat in his armchair and sipped a special brew of moss tea with honeysuckle blossoms. A noise came from the egg. “The egg.” Joby put the cup of tea down and walked over to the egg. He put his ear to it and heard a soft pecking sound. “I do believe the egg is about to hatch. I hope it's not an alligator. If it is, I'll have to put him in the moat with the other creatures.” The pecking continued. The baby dragon licked Joby's hand. Joby took Smoky out every day into the woods and taught him to fly and to breathe fire and to do all sorts of dragon things. Day by day Smoky grew larger and larger. 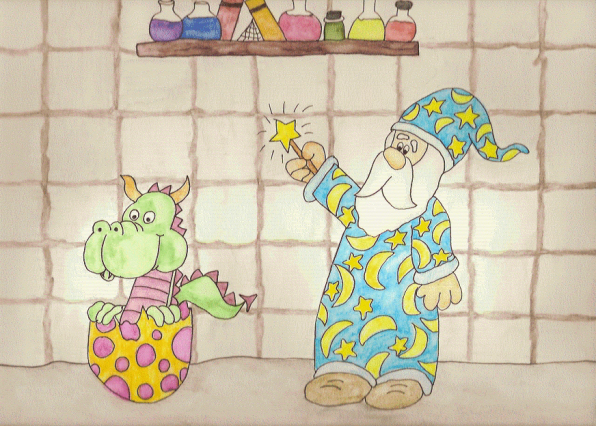 Joby showed the high wizard all the tricks he'd taught his dragon. “You've shown a great talent by teaching that dragon. We want you to be in charge of all the dragons in the kingdom. You are to teach them everything they need to know,” the head wizard said. Joby was so happy. He took Smoky and flew around the kingdom looking for dragons. He formed a Dragon School and all the dragons loved and respected him. Never again did Joby feel sad or left out. He moved to one of the big rooms in the castle, instead of the dark little room in the bottom part of the castle. He hung a sign on his door, “Joby, the Dragon Teacher,” and spent the rest of his days with the creatures he loved the most, the dragons.